At first he was like a shadow. Now and then we would see his large grey form moving silently through the trees on the other side of the river. The elephants have been so heavily poached that they are extremely wary of man; we had only seen elephants from the ground 4 times in 4 years. Each time they had screamed and run away from us, leaving us standing alone on some dusty, deserted spot. From our airplane we had counted 5000 elephants in North Luangwa National Park, so we knew that there was a viable population. We desperately wanted some of the elephants to accept us; we needed a sign that our program to conserve them was working. Then one afternoon we heard loud rustling noises in the small Combretum trees which border camp. Mark and I stalked to the trees and watched in wonder as an elephant stood right on the edge of camp. He held his trunk high in the air, taking in the sweet scent of thousands of Marula fruits which lay as thick as honey over the ground. We had built our camp here because the Marula trees offer lush shade in the hot season, but this elephant's family had probably been coming to this grove to eat the fruits for many generations. Now our camp stood in his way. The elephant took one step toward the fruits. Then he stopped and stood, swinging his right foot back and forth above the ground. Silently we willed him to keep coming. If only he would come into camp, it would be a sign that he trusted us. Again he took a step forward; again he stopped. He could see us standing 30 yards away from him, but he did not run. For 20 minutes he stood there, periodically holding his trunk up high to take in the tempting sugary scent of the Marulas. Finally, as if released from some invisible grip, he walked quickly into camp to within ten yards of the office cottage, where he began feeding on the fruits. That was just the beginning. The elephant began coming into camp every day feeding on the fruits with us standing only 10 yards away. There were 4 other males in his group, whom we would see from time to time in the distance, but only this male would come into camp. Seventy percent of the elephants in this area had been shot by poachers before we came. The ones that remain are cunning, alert, and afraid of man. But this elephant had learned to trust us. 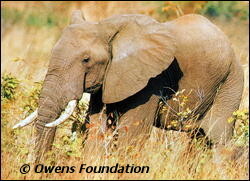 He represents hope for all elephants; we named him Survivor.